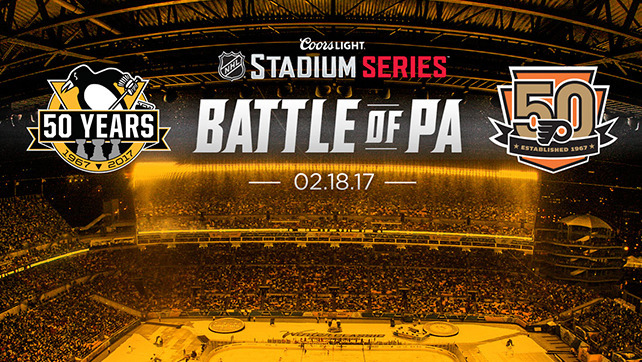 The Pittsburgh Penguins and the Philadelphia Flyers will bring their heated in-state rivalry to Heinz Field on Saturday February 18th, 2017. The outdoor game will be part of the 2017 Coors Light Stadium Series. This will be the second outdoor game played at the home of the National Football Leagues Pittsburgh Steelers, Heinz Field in Pittsburgh, Pennsylvania. The last time Heinz Field was occupied for a hockey game was the 2010 Winter Classic between the Penguins and the Washington Capitals. The Pens will be looking to improve their record as they dropped the Winter Classic to the Capitals. The game will also serve as a celebration of the Penguins and the Flyers becoming NHL expansion franchises 50 years ago in 1967. The two have met 274 times during the regular season and six times in the Stanley Cup Playoffs. Philadelphia leads in both categories. Information surrounding the television info and ticketing for the game will be released in the coming months. Put the right logo in. We have 4 Cups!! !